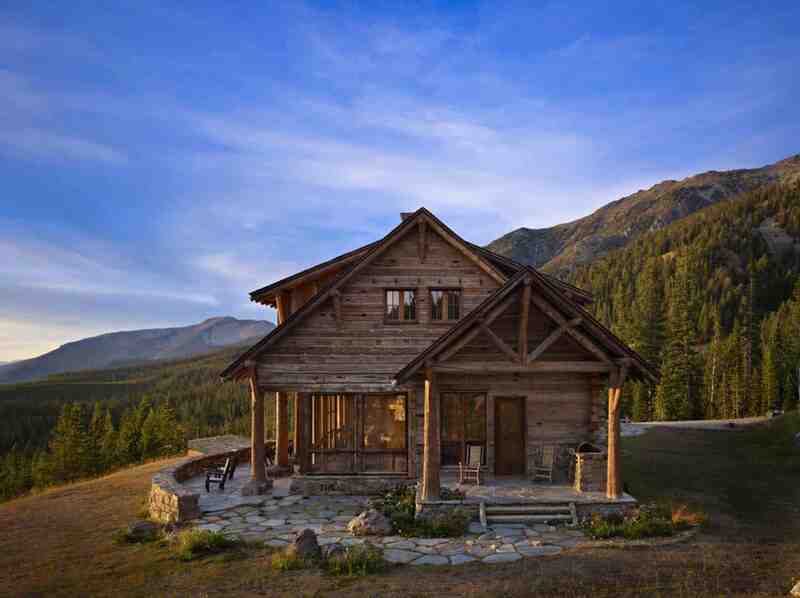 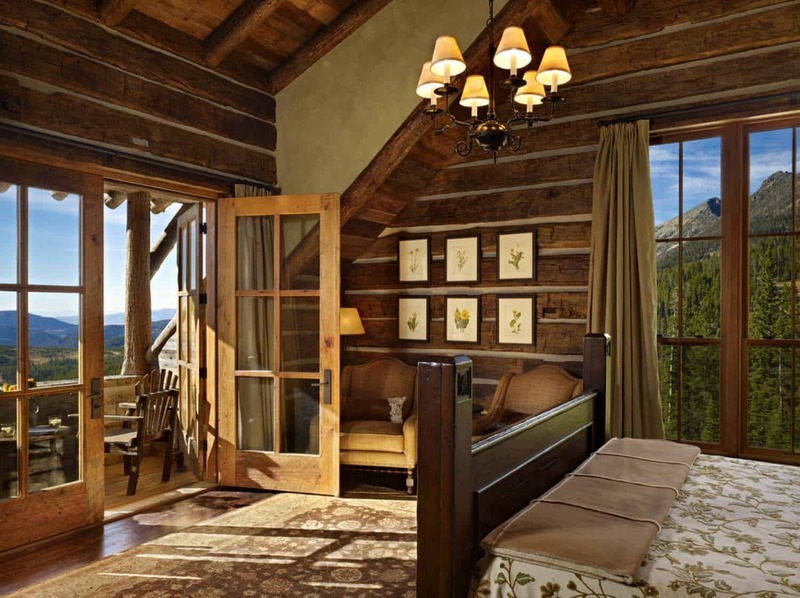 This breathtaking mountain retreat infused with rustic styling was designed by Miller-Roodell Architects along with builder Yellowstone Traditions, located in Big Sky, Montana. 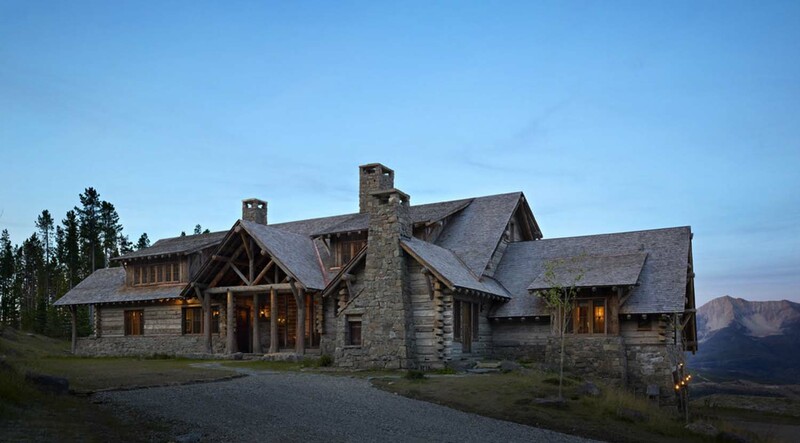 The home builders motto is to “unite innovation and imagination with time-honored craftsmanship to construct one-of-a-kind structures with minimal impact to the natural landscapes they inhabit.” This is exactly what they did when they designed this incredible mountain home. 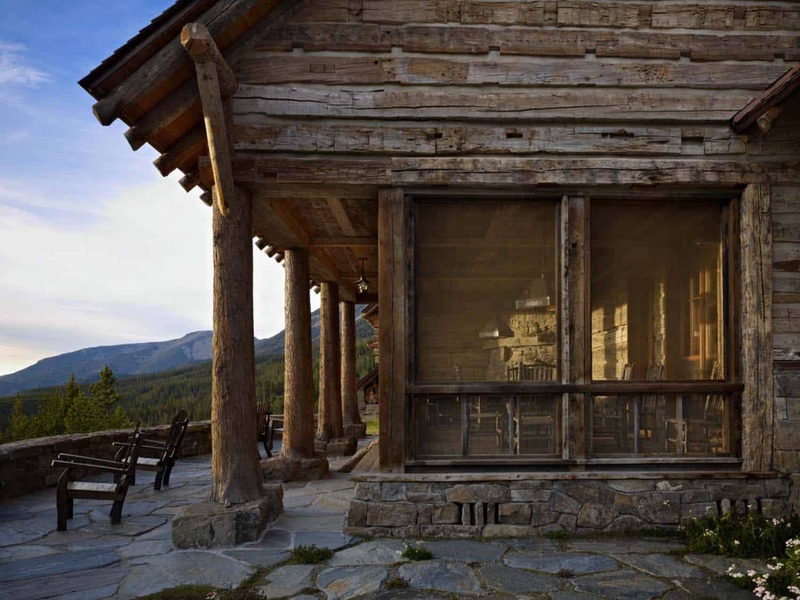 They focused on capturing the spirit of nearby Yellowstone National Park with the design of this structure. 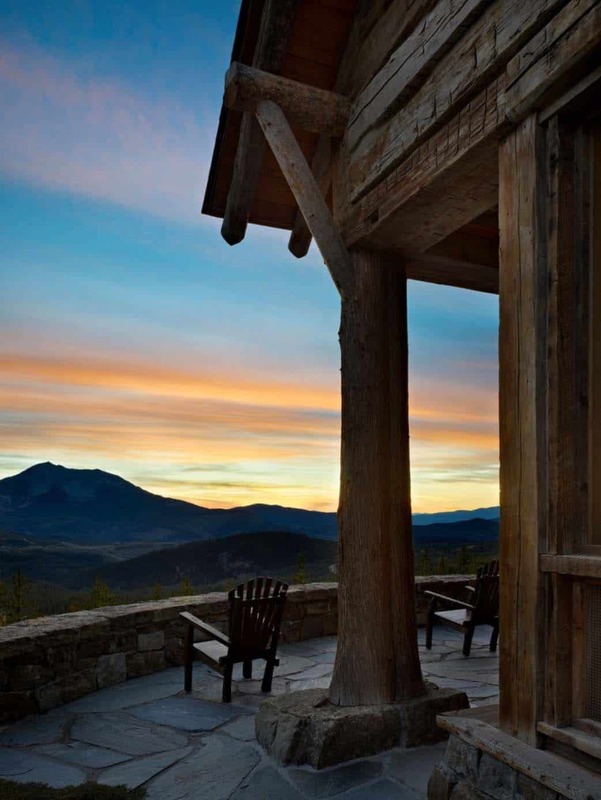 Inside, you will find almost 8,000 square feet of living space to delight your senses and wow your imagination. 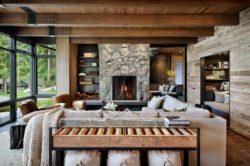 With layers of texture and natural materials throughout, this home offers plenty of warmth and comfort. 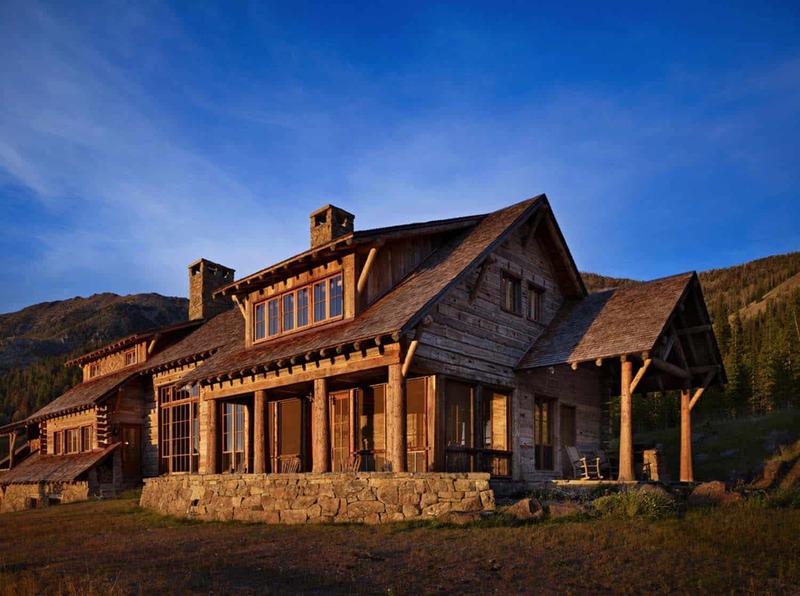 From the two-story exterior facade, positioned high up on the mountainside, sweeping vistas of the rugged landscape offers visual contentment. 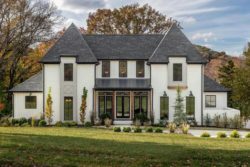 With a peaceful landscape to work with, the design team needed to create a home that would integrate well with its environment. 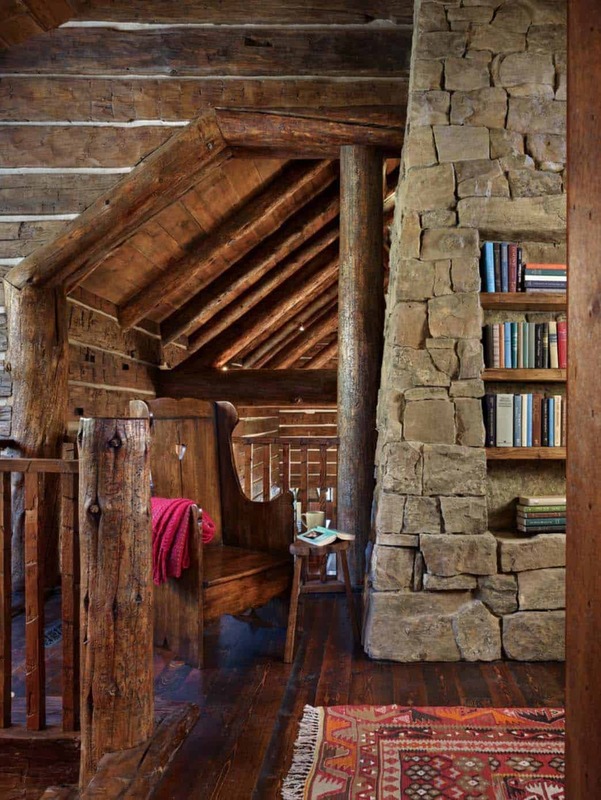 They incorporated indigenous stone and standing dead lodge pole pine into the structure, which was sourced from the site. 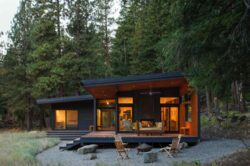 The dwelling features a cutting-edge rooftop sprinkler system for protection from fires. 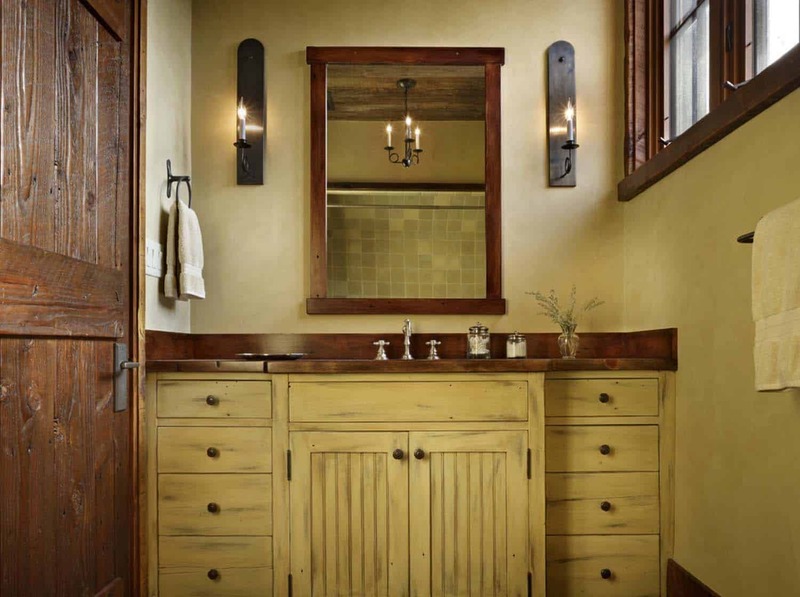 On the interior, showcase elements includes: custom-forged hardware as well as custom handcrafted furnishings and doors. 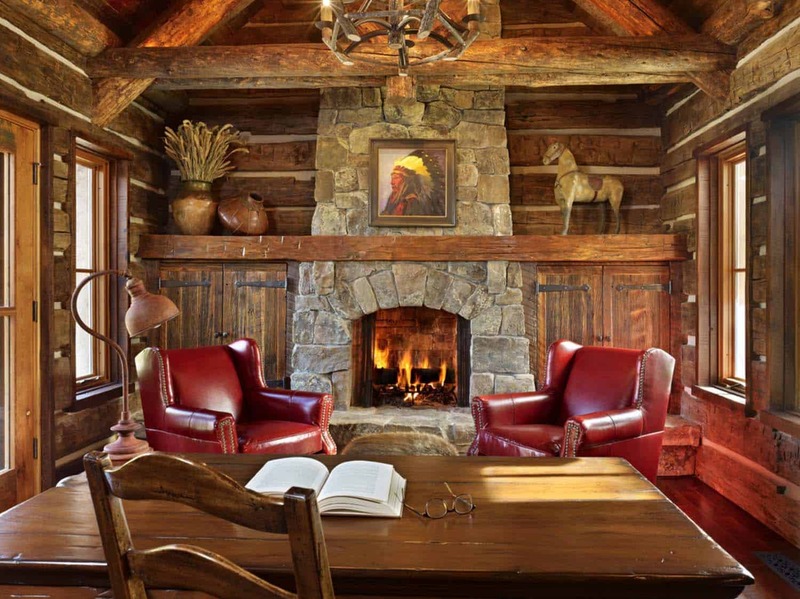 The interior designers that worked on this project is Bozeman, Montana-based Haven Interior Design. 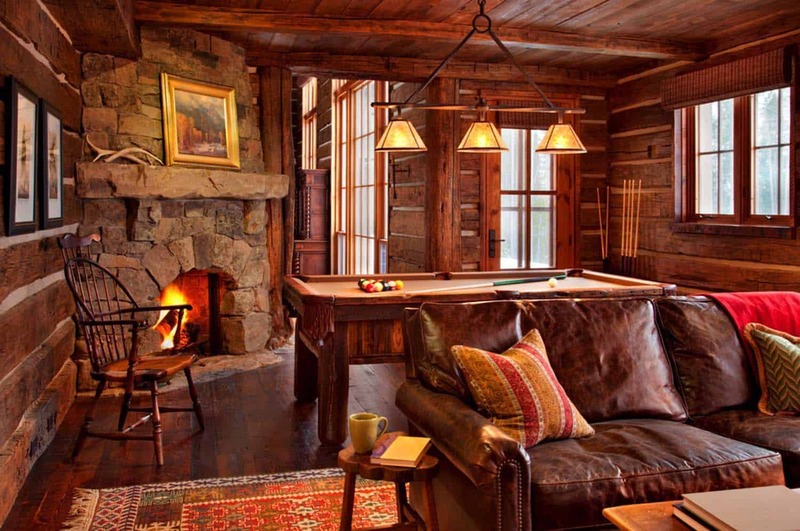 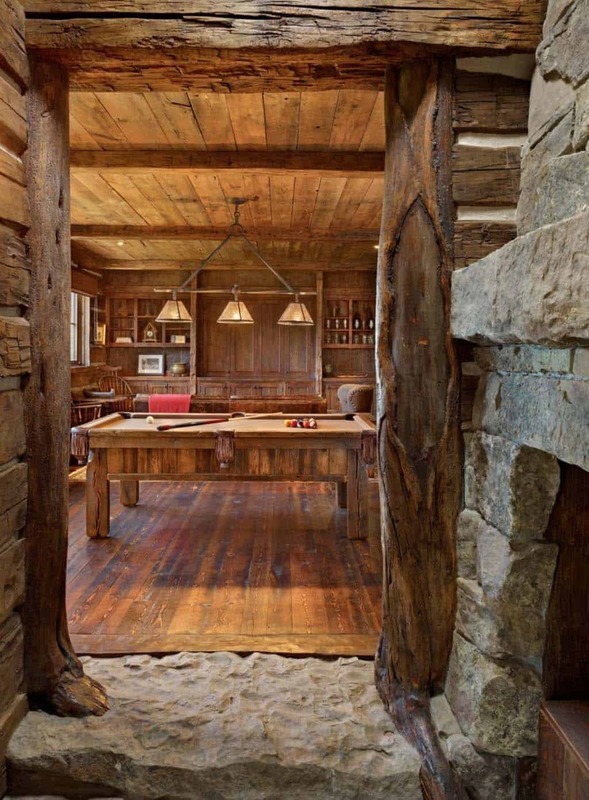 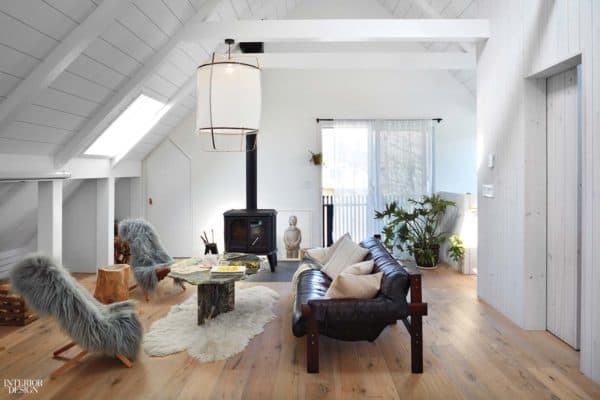 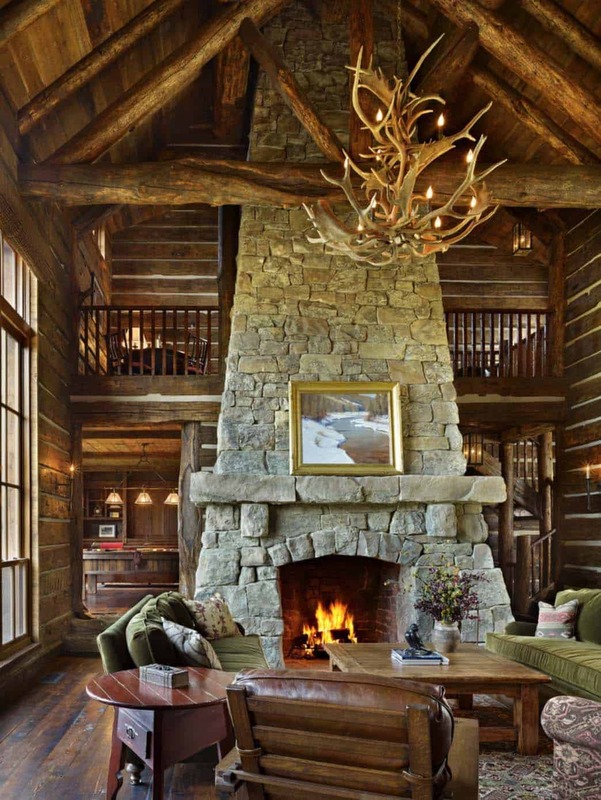 What We Love: This rustic retreat is warm and welcoming from the point of entry. 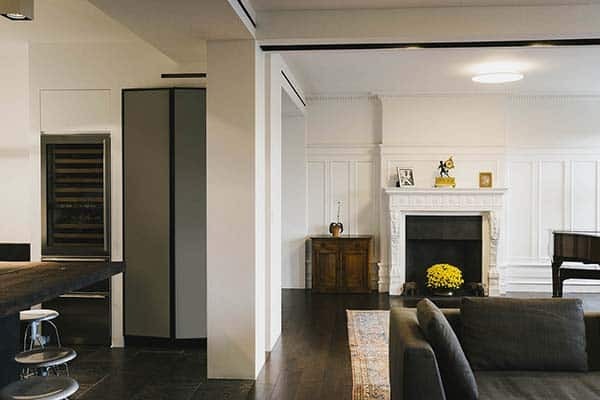 Walls of glass enables you to see straight through to the back of the property. 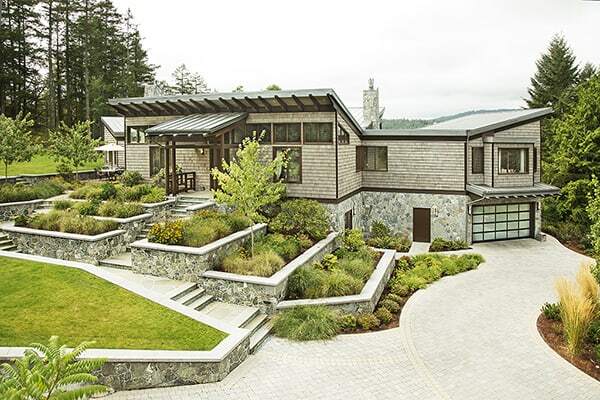 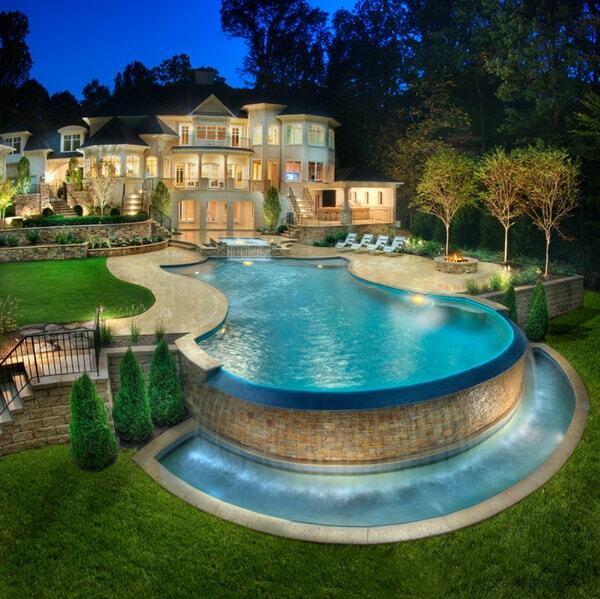 The architectural design offers a striking beauty, both inside and out. 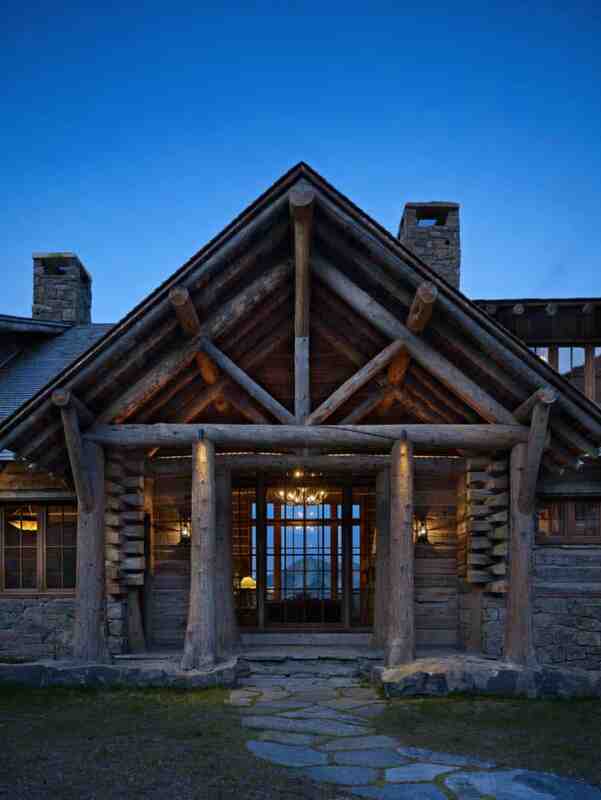 We love the standing pine logs at the entrance, offering an authentic log home feel. 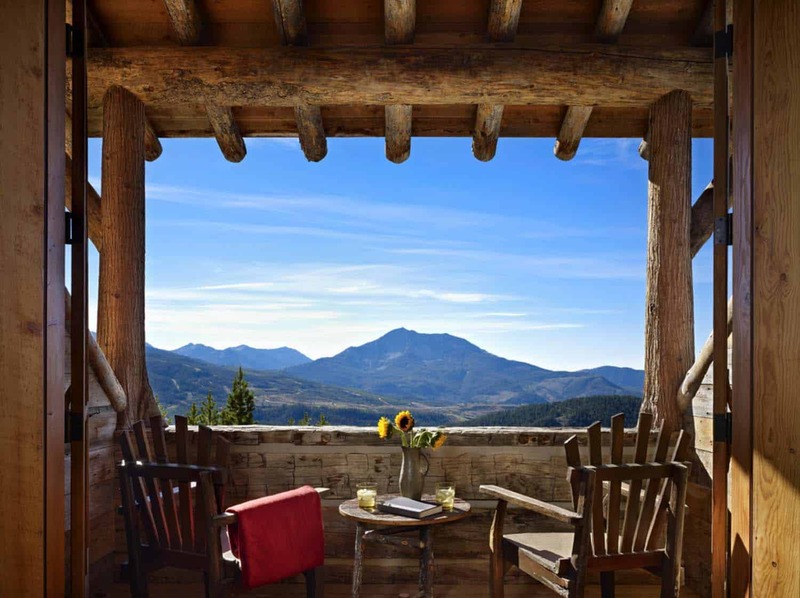 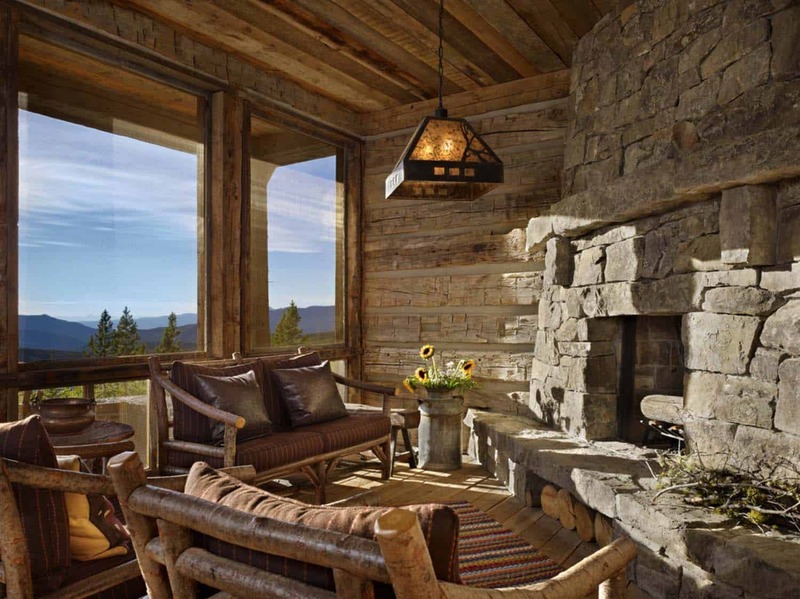 The mixture of stone and wood on the inside is both warm and rustic, making this an ideal mountain getaway… Readers, what are your thoughts on this mountain pad, would this be your dream vacation home? 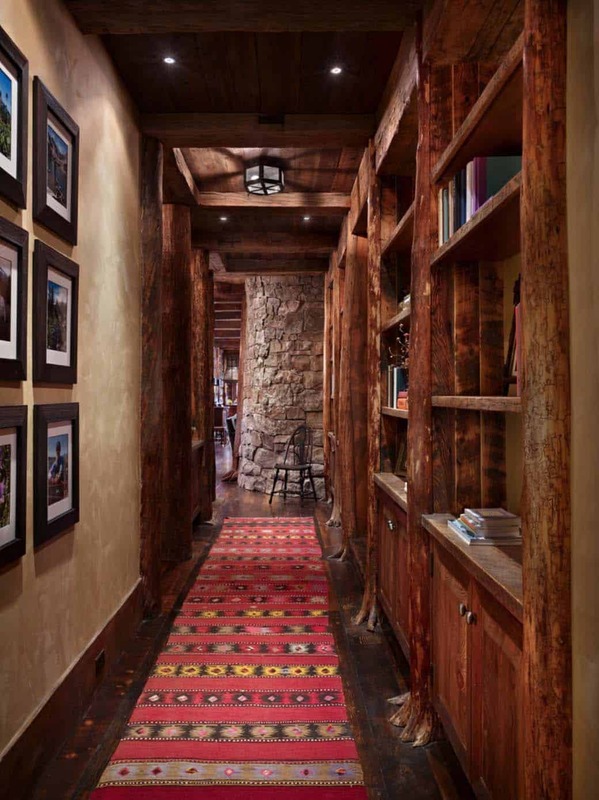 Note: Have a look below for the “Related” tags for more spectacular home tours that we have featured here on One Kindesign from the portfolio of Miller-Roodell Architects. 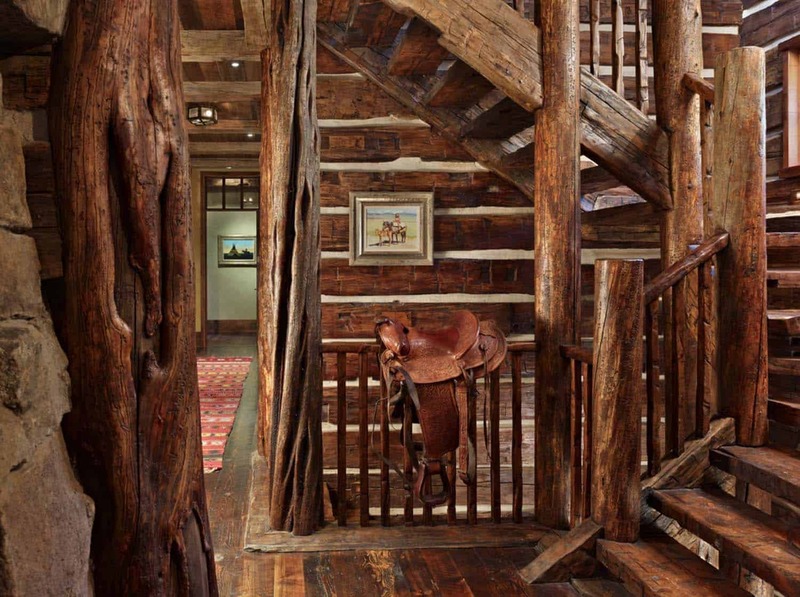 Above: The strap hinges on the front door were sourced from Bar Mill Iron Forge out of Big Timber, Montana. 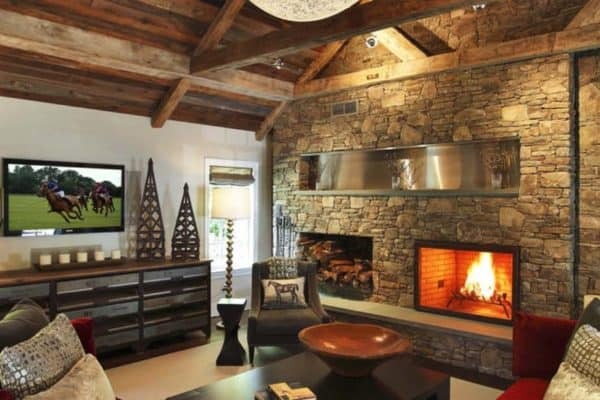 Above: The fireplace stone is Buffalo Jump Moss Rock, sourced from Select Stone. 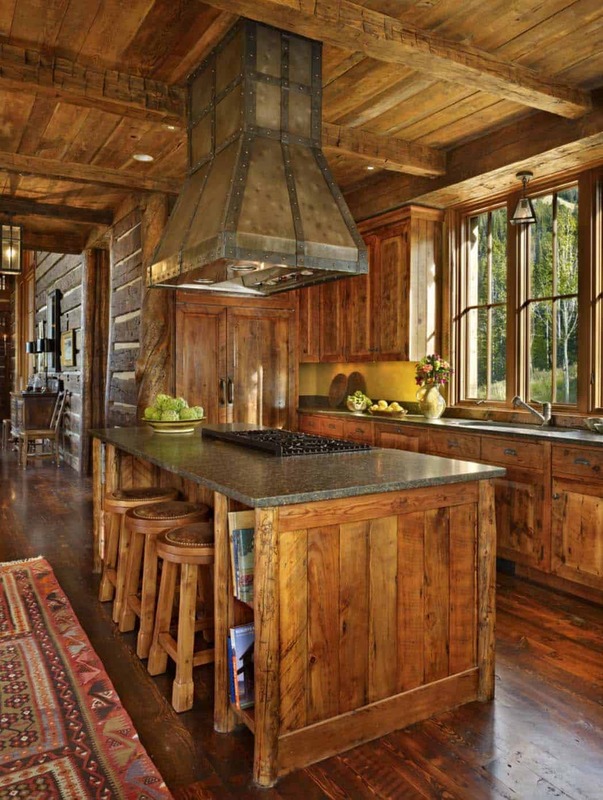 Above: The kitchen island dimensions are 3.5 feet x 8 feet. 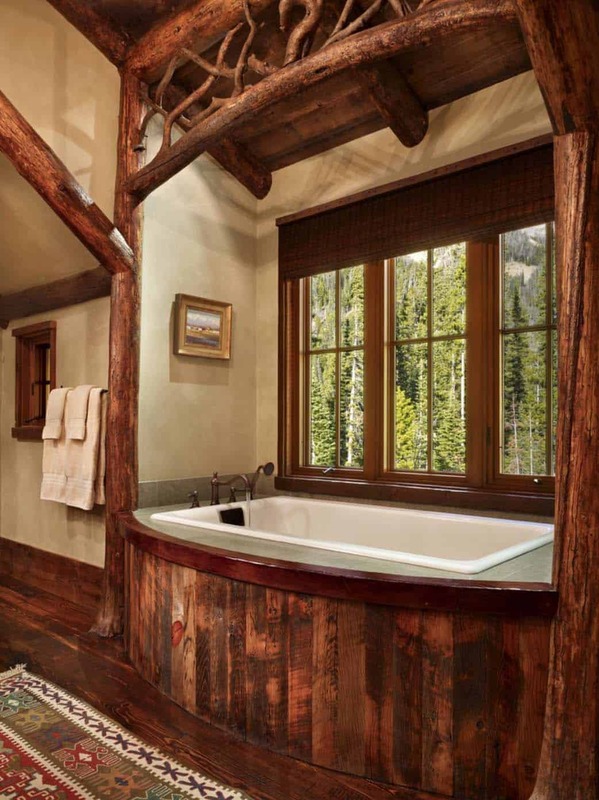 Island counter stools are from Epoch West in Bozeman, Montana. 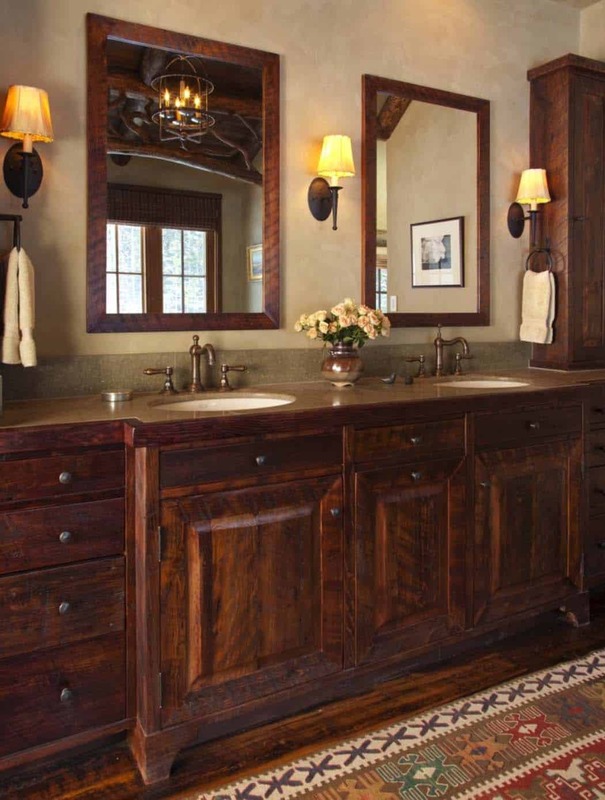 The flooring and cabinetry are circle sawn pine with a stain. 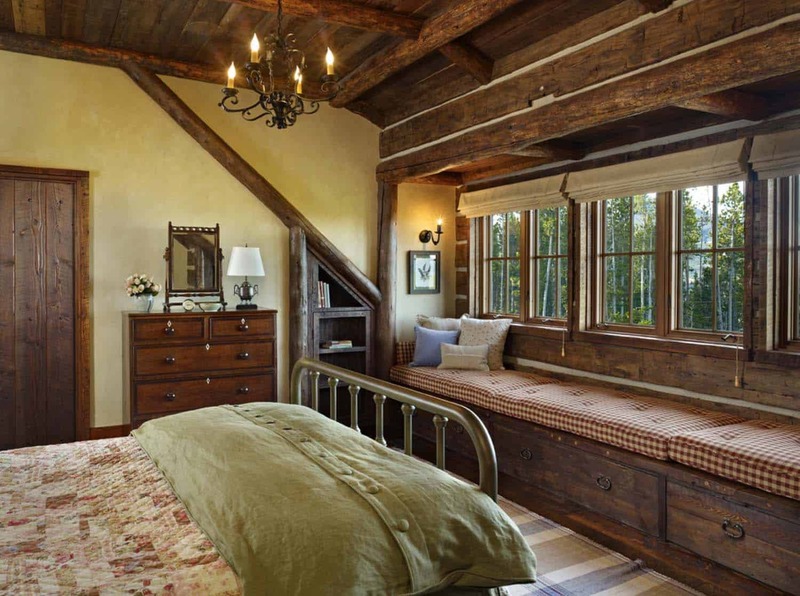 Above: The beds were custom designed by the builder. 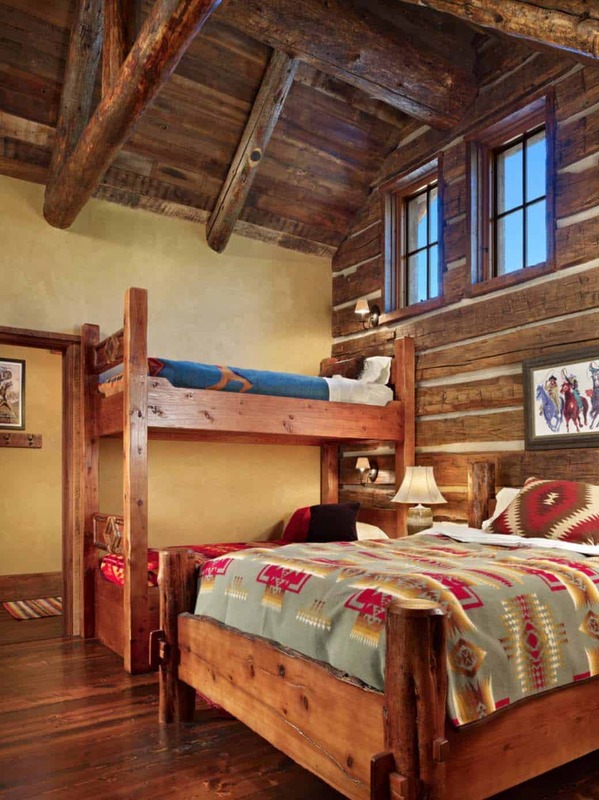 The bedding on the queen bed is the Pendleton Chief Joseph blanket – green. 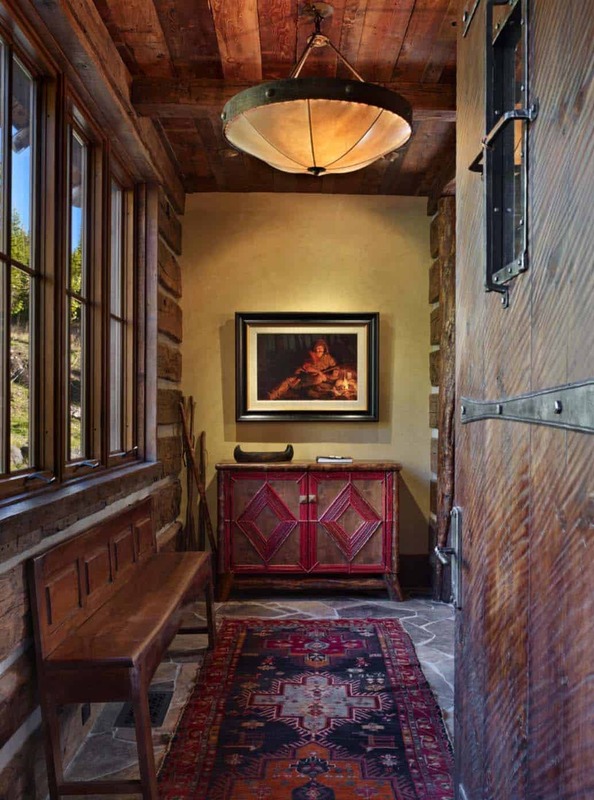 Above: The walls and bench seats of this rustic entryway were custom fabricated out of reclaimed barn wood with a clear coat. 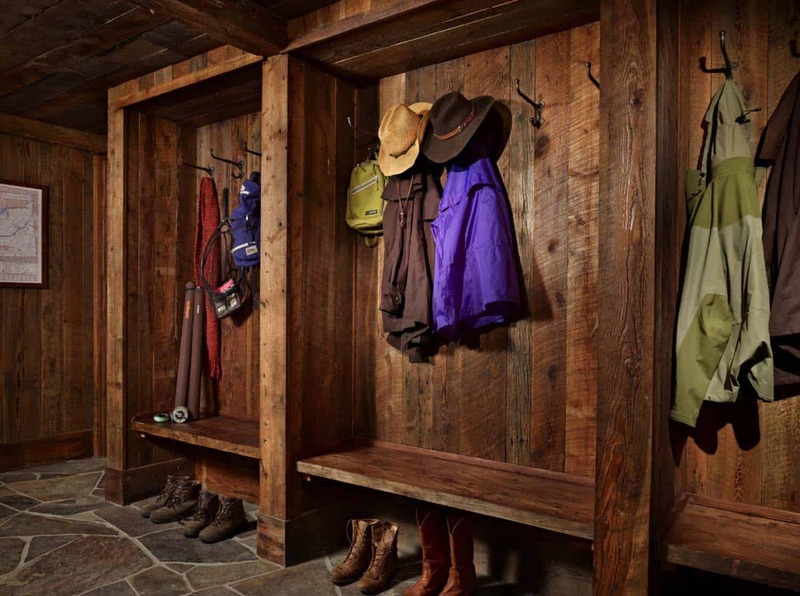 The hooks are from Weaver Leather. 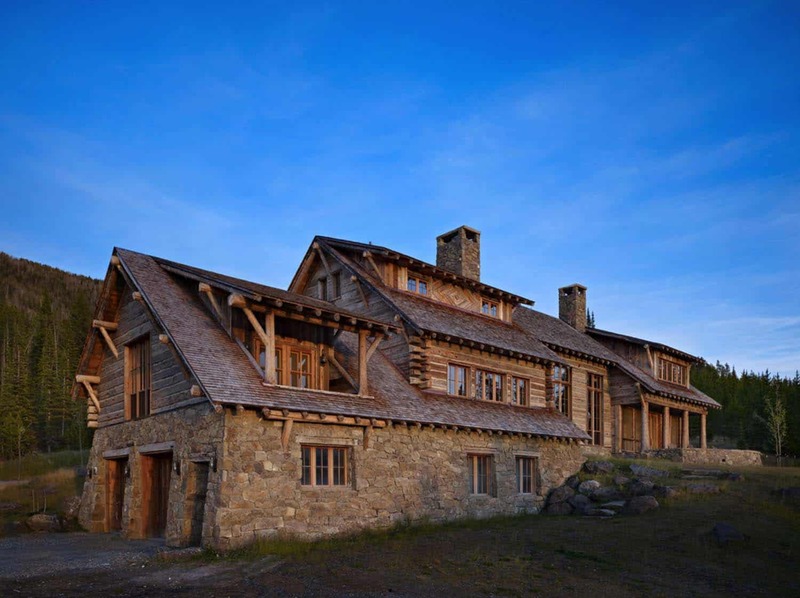 Above: The stone used on the exterior facade is Montana Sandstone and the source is Quarry Works. 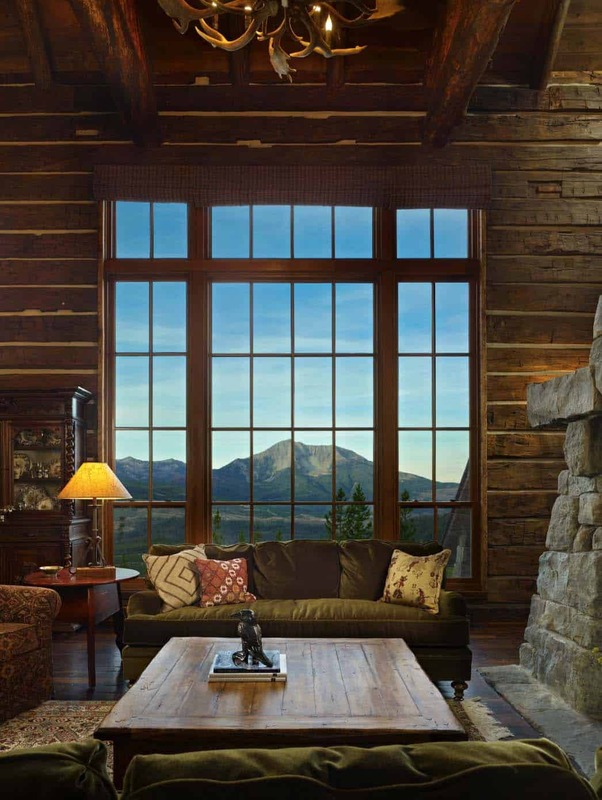 The windows came from Dynamic Windows, while the trim is an aged material with a clear sealer.